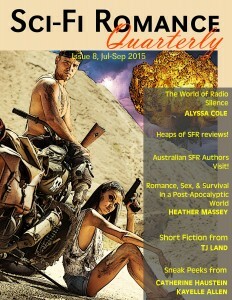 This issue contains a plethora of reviews, an educational editorial from KS Augustin, all the new release information, an opinion piece from author Alyssa Cole, an original short story from debut author TJ Land, a survey of post-apocalyptic romance from Heather Massey, and a fun feature on Australian authors of Science Fiction Romance. Yep, it’s another packed issue! The issue can be read on your computer or can be downloaded in pdf, mobi, prc, and epub formats. There’s also a beautiful flipmag. Read on your computer or device HERE or download your copy HERE. And don’t forget we have seven other issues you can download or you can browse our archives. This entry was posted in Book Reviews, Science Fiction and Science Fiction Romance and tagged post-apocalyptic fiction, post-apocalyptic romance, science fiction romance, Science Fiction Romance Quarterly, SciFiRom, SFR. Bookmark the permalink.